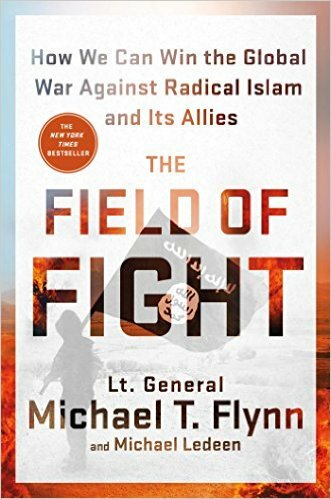 I have just spent a couple of miserable hours reading General Michael Flynn’s and Michael Ledeen’s book, The Field Of Flight. He will be President Trump’s national security adviser. And, frankly, I don’t know where to begin. As someone who is opposed to the regime of the mullahs and would like to see the end of that regime through peaceful and democratic means, I truly cannot understand the reason for what one can call the irrational hostility and the depth of hatred of people like Flynn and Michael Ledeen towards Iran. Of course they are entitled to their feelings of hatred and hostility towards Iran and Muslims as a whole, but they are not entitled to their facts. It is really amazing to see how without any concern for the facts Flynn jumps from one subject to another, one minute writing about Al-Qaeda, then about ISIS, and then accusing Iran of being behind both of them. It is quite understandable that as someone who has served in Iraq and has been involved in probably the greatest fiasco in US foreign policy, General Flynn has blocked out of his mind certain issues, such as the killing of hundreds of thousands of poor Iraqis, “shock and awe”, destroying the country, organizing torture chambers such as Abu Ghraib prison, making the entire Iraqi army personnel and the civil servants, who now constitute the main backers of ISIS, redundant etc. However, one expects such an academic and experienced general to ask himself where al-Qaeda in Afghanistan was prior to the training of the mujahedin by the United States, Pakistan and Saudi Arabia? Where was al-Qaeda in Iraq prior to the U.S. invasion and the toppling of the secular government of Saddam Hussein? Where were the terrorists in Syria prior to the creation of the “moderate” insurgents in that country by the US and her “local allies”? Who were the terrorists who attacked the United States on 9/11? Who constituted practically the entire bulk of the suicide bombers? A study by an American academic shows that while there have been hundreds of Sunni suicide bombers, he has not been able to identify a single Iranian suicide bomber. General Flynn admits that more than 30,000 foreign terrorists have poured into Syria and are fighting against Bashar al-Assad’s secular government. Surely he knows who has organized them, funded them, armed them and which countries they have passed through before getting to Syria. It seems to have escaped his attention that when the United States was helping the Mujahedin in Afghanistan that morphed into al-Qaeda, Iran was fighting against them and was supporting the Northern Alliance that formed the government of Afghanistan after the US invasion. Flynn refers to Iran helping Russia and Syria to fight against the insurgents in Syria, but in the same breath he accuses Iran, a staunchly Shi’a country that is the main target of the militant Sunni ISIS, of being behind both al Qaeda and ISIS. General Flynn keeps repeating that Iran’s clerical regime cannot be reformed and that the only way to deal with it is to bring about a regime change. Apart from the fact that a number of regime changes in Afghanistan, Iraq, Libya, and Syria have not been very successful, Iran has reached a comprehensive agreement not only with the United States but with all the five permanent members of the Security Council, plus Germany, and that agreement has also been sealed with a Security Council resolution. According to the IAEA, Iran has carried out all its commitments under that agreement, and surely it is time to build on it and get Iran more fully integrated into the international community and the West, instead of tearing up that agreement. During the presidential campaign, President-elect Donald Trump repeatedly criticized the wasteful US wars in the Middle East and vowed that he would pursue a different course. However, with the views of General Flynn and other senior nominees, it seems that we are not going back even to the worst days of the Bush Administration, but to something even more militant and more dangerous. Those who will serve in the new administration should try to calm the tensions in the Middle East and push for a new era of peace and cooperation based on a system of collective security, which would free the United States of continuous entanglement in that region, and which would also help Israel about whose wellbeing the general is so concerned. That requires a more rational and realistic assessment of the realities in the Middle East, and a more nuanced and diplomatic outlook that does not see war and regime change as the only solution to all the problems in the world. One can only hope that when President-elect Trump and the members of his team assume the burden of office they will adopt more realistic and more peaceful policies. Otherwise, not only the Middle East will go through more wars and bloodshed, but the United States will also be more isolated as it alienates the majority of people in Europe and elsewhere.